My Afternoon Sketch, originally uploaded by Liquidmethod. 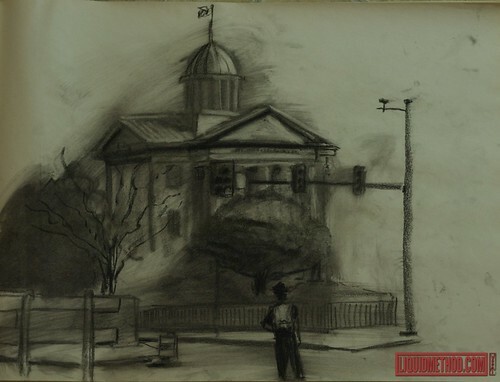 So I'm trying my hand at using charcoal on newsprint to do some building studies. Moleskines are awesome, but it was a nice day and I was up for a 25 min challenge. Buildings are tough. But the cop was really cool, so I added him into the scene. I'm looking forward to nicer days when drawing this big will be really nice. The wind was the trickiest part. Next time I'll bring tape and a board. MacArthur Memorial, Norfolk, Va.